Geoffrey Emerick (born in 1946) is an English recording studio audio engineer, who is best known for his work with the Beatles on their albums Revolver, Sgt. Pepper's Lonely Hearts Club Band, The Beatles and Abbey Road. Emerick first started working as an assistant engineer at EMI at the age of 15. To familiarize himself with his work, he was placed under the supervision of another assistant engineer, Richard Langham. On his second day of work at EMI, Richard Langham was assigned to be the assistant engineer of Norman Smith, who would be doing the first recording session of the Beatles in the evening. As a new recruit, Emerick was not entitled to get over-time pay, but was lucky enough to witness the first-ever EMI recording session by the finalised line-up of the Beatles in 1962, during which the group recorded for the first time with new drummer Ringo Starr on what would eventually become their first hit single "Love Me Do". As assistant engineer, Emerick worked on numerous early recordings by the Beatles, and also helped record other artists for the label, including Judy Garland. He assisted at the EMI artist test of the Hollies. Emerick abandoned work on The Beatles on 16 July 1968, fed up with the tensions and arguments that hampered the sessions. He returned to work with the Beatles on Abbey Road. Emerick received Grammy Awards for the engineering of Sgt. Pepper's Lonely Hearts Club Band and Abbey Road. Despite his departure from the "White Album" sessions, Emerick remained on good terms with the Beatles, particularly Paul McCartney, who invited Emerick to quit EMI and come and work for their company, Apple Corps Ltd., in 1969. In addition to engineering duties, Emerick would oversee the building of the Apple recording studio. His post-Beatles career included work with Paul McCartney (including Band On The Run, which netted Emerick another Grammy, London Town, and Flaming Pie), Elvis Costello (for whom he produced Imperial Bedroom and All This Useless Beauty), Badfinger, Art Garfunkel, America, Gino Vannelli, Supertramp, Cheap Trick, Nazareth, Chris Bell, Split Enz, Trevor Rabin, Nick Heyward, Big Country, Gentle Giant, Mahavishnu Orchestra, Ultravox, Matthew Fisher's first solo album "Journey's End," Kate Bush's demo tape to EMI, which landed her a record deal, and Jeff Beck, as well as Nellie McKay's critically acclaimed 2004 debut CD Get Away from Me. He was the sound engineer on Robin Trower's album Bridge of Sighs, and credited by both Trower and producer Matthew Fisher for that album's acclaimed sound. He also recorded the debut album for Stealers Wheel, featuring the single "Stuck In The Middle With You" as well as The Zombies famed "Odessey and Oracle" album featuring "Time Of The Season". In 2003, he received his fourth Grammy, a Special Merit/Technical Grammy Award. On 3 April 2007 it was announced that Emerick would be in charge of a re-recording of Sgt. Pepper's Lonely Hearts Club Band by contemporary artists, including Oasis, The Killers, Travis and Razorlight. Emerick used the original equipment to record the new versions of the songs, and the results were broadcast on BBC Radio 2 on 2 June 2007, marking the album's 40th anniversary. He now resides in Los Angeles. ↑ Droney, Maureen (1 October 2002). 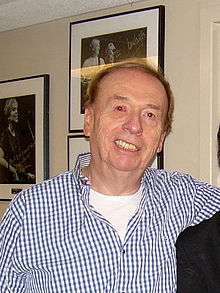 "Geoff Emerick". Mix Magazine. Retrieved 4 March 2013. 1 2 3 Emerick, Geoff; Massey, Howard (2006). Here, There, and Everywhere: My Life Recording the Music of The Beatles. New York, NY: Penguin Group (USA) Inc. p. 387. ISBN 1-59240-179-1. 1 2 "CNN.com - The teenager who shaped the Beatles - Apr 7, 2006". CNN. Retrieved 2010-05-03. ↑ Lewisohn, Mark (1988). The Beatles Recording Sessions. New York: Harmony Books. pp. 98, 99, 105–106. ISBN 0-517-57066-1. ↑ "The Rightful Heir?". Q Magazine #48. September 1990. Retrieved 2011-07-23.